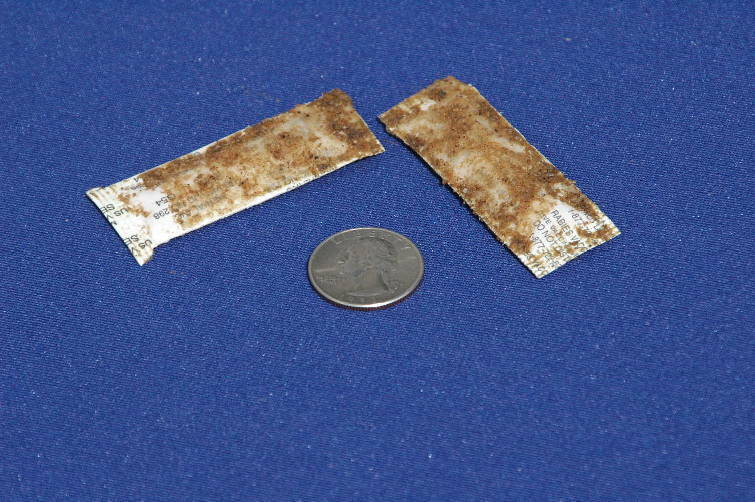 Oral rabies vaccine (ORV) baits shown in relation to the size of a quarter. Some Tennesseans may start to see some small coated plastic packets pop up in southcentral portions of the state starting next week. Oral rabies vaccine baits (ORVs) will be dropped by low-flying aircraft from Monday, Sept. 25 through Wednesday, Oct. 25 in several Tennessee counties, according to a news release from the U.S. Department of Agriculture's Wildlife Services. The ORVs, which are small white plastic packets coated in fishmeal crumbles, will be placed in raccoon habitats to help prevent the spread of rabies in the state. This is the 16th year that ORVs have been given in Tennessee and the 15th year that Hamilton County has been baited, according to Erin Patrick, a certified wildlife biologist with Tennessee Wildlife Services. "We went from a high of 14 cases of raccoon variant rabies in Hamilton County in 2004 to having none in the county since 2008," Patrick said in an email. "We continue baiting the area because we have had positives in Georgia and Alabama not far from the border. Our project has been a success in Hamilton County and we are continuously doing enhanced rabies surveillance to make sure there are no cases of rabies in the area." The ORV baits should be left alone, but in cases where they are found in area where children or pets play, they should be moved to a fencerow, woodlot, ditch or other potential raccoon habitat with a gloved hand. Residents who find damaged baits should bag the bait and dispose of it in the trash. Anyone who has skin contact with an ORV bait should wash their hands thoroughly afterwards, according to the release. While the baits are not harmful to pets, eating too many may cause vomiting or diarrhea to occur. If pet owners find their animal has gotten hold of or eaten a bait, they should confine their pet before checking and removing any additional bait found in the area. Pet owners should not risk getting bitten by taking bait away from their pet, and should avoid their animal's saliva for 24 hours and wash any skin that may have been licked if they suspect a bait was eaten.